Swimming hole in deep, clear pool in river under footbridge at Blue Heron picnic and camping area. Blue Heron campground is at this site. Also, there are 2 campgrounds in Daniel Boone N.F. near Blue Heron - Hemlock Grove and Great Meadow campgrounds ore both west of Stearns off RT 92. From London, go south on I-75 to Williamsburg. Then west on RT 92 past RT 27 to Pine Knot. From Pine Knot, take RT 1651 northwest to Revlo. From Revlo, take RT 742 southwest to "Mine 18 Road". Go west on Mine 18 Road into the Big South Fork N.R.A. and continue on to the Blue Heron to the picnicking and camping area. At the beginning of the trail to the Catawba Overlook, the trail crosses a footbridge. The swimming hole is beneath this footbridge (I think). 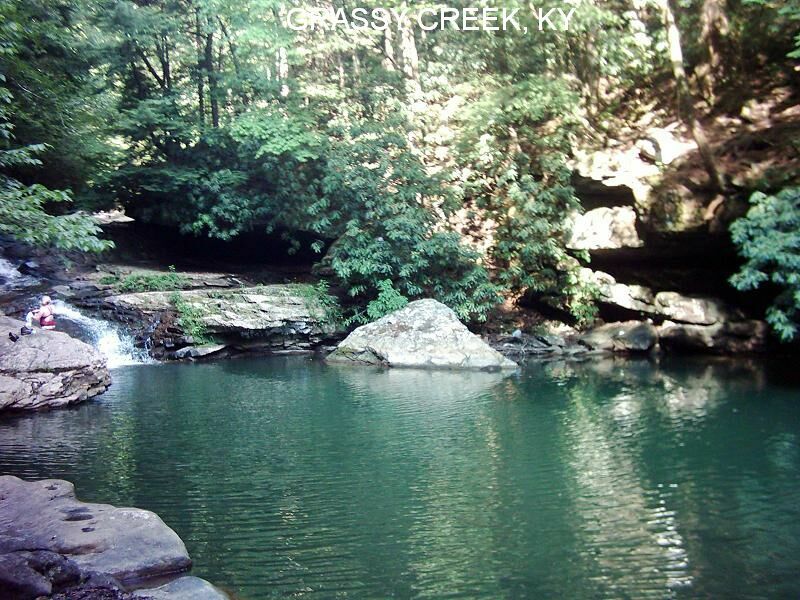 Several creek/river swimming places right on the KY/VA state line in the Breaks Interstate Park. See DIRECTIONS below for details. 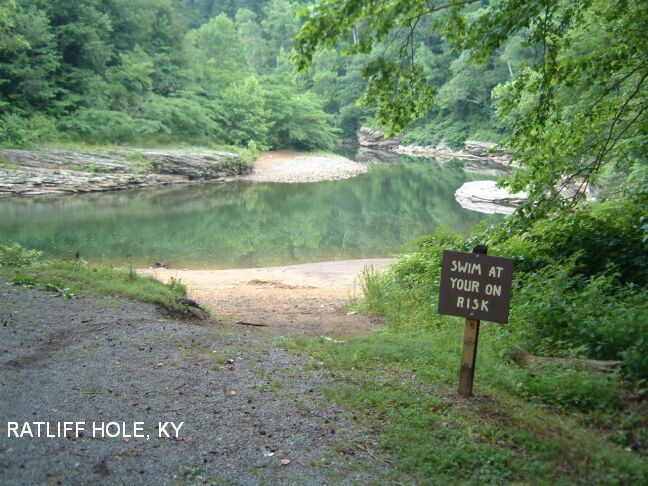 RATLIFF HOLE [RATL]: A semi-official swimming and tubing area in the Russell Fork River at a State Park picnic area. PHOTO 1 , PHOTO 2 . Has bathrooms and picnic tables - sometimes inner tubes are rented here also. LAT, LON :lat=37.2973, lon=-82.3256(source: measured) (accuracy:exact) LINK TO GOOGLE MAP. To get here from RT 80 east of Elkhorn City, look for a Breaks Interstate Park Recreation Area sign (I don't believe it says Ratliff Hole but it is.) on the right side of the road. Turn right and drive down the paved steep incline and stay right. If you go during the summer there is a little shack that some people rent rafts and tubes out of. Very confident. Verified 6/2006. Updated 6/28/2006. 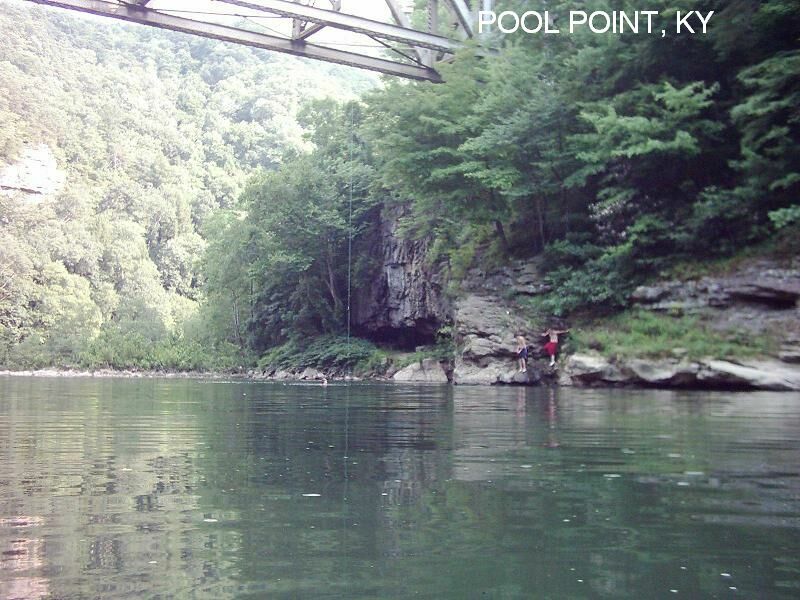 POOL POINT [POOL]: Pool Point is also in the Russell Fork River and you walk there from Ratliff Hole. A fan says:� This is one of the best places I have ever been. I could not believe I did not see it on your site. Then again I could not find information about Pool Point anywhere on the net. Perhaps it's a secret. PHOTO 1 , PHOTO 2 , PHOTO 3 , PHOTO 4. 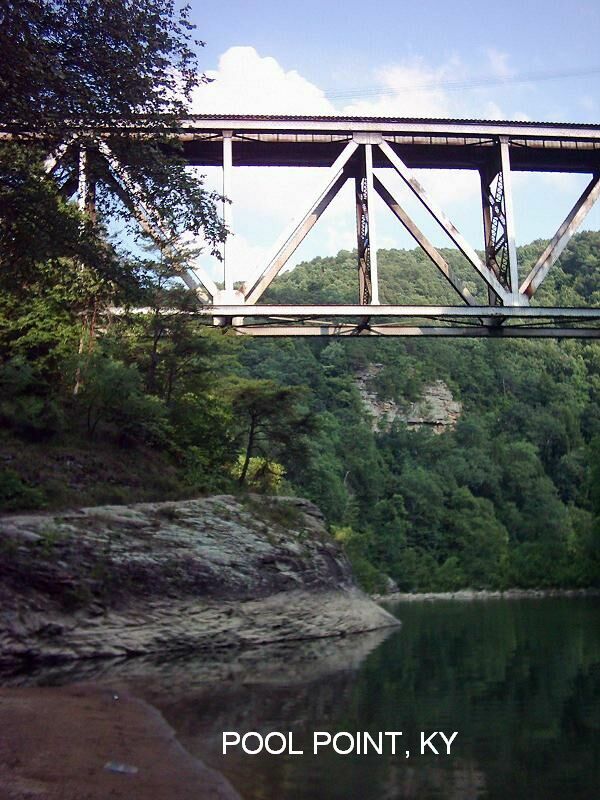 It is located on the Russell Fork River directly under the Pool Point Trestle. Cliffs range from 25-80 feet in height. 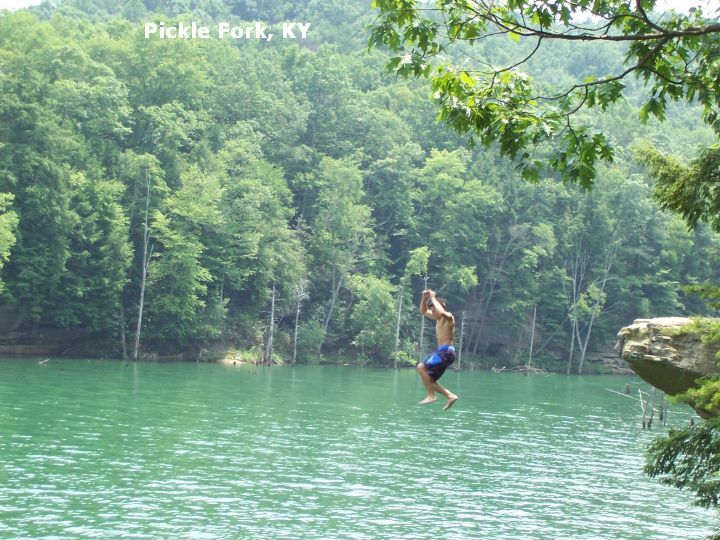 Great for jumping and a spectacular rope swing. LAT, LON :lat=37.2931, lon=-82.3242(source: Topozone) (accuracy:exact) LINK TO GOOGLE MAP. To get here from Ratliff Hole, just ask for directions to the trestle from there. 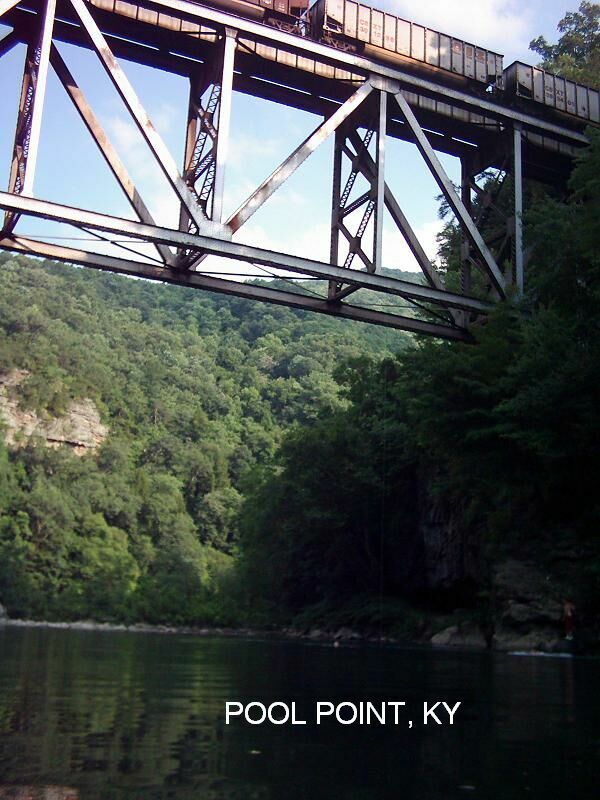 You cross over the river (swim) to a sandy beach and follow the trail around the bend downstream to spot the trestle. It's only about 150 yds away from Ratliff Hole." Very confident. Partially verified 6/2006. Updated 6/28/2006. 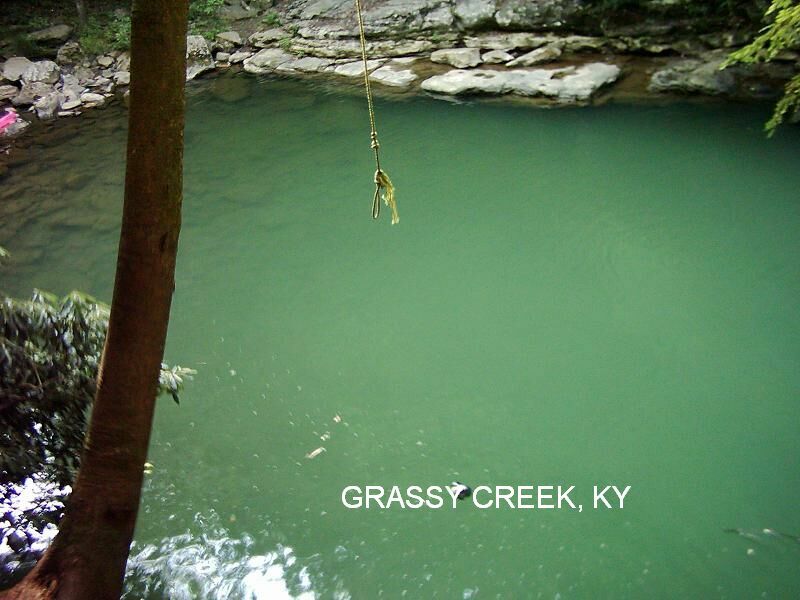 GRASSY CREEK [GRAS]: Right near the VA/KY border, in Breaks Interstate Park, is Grassy Creek with several pools, some with jumping - all spectacular! YOUTUBE (Uncertain that this is the place). . The main one is 10 feet deep and has a rope swing about 15 feet over the water. The water is usually blue and fish can be seen swimming around. There are also good rocks for sunbathing. LAT, LON :lat=37.29638, lon=-82.31211(source: DeLorme) (accuracy: exact) LINK TO GOOGLE MAP. NOTE: This is not a long or strenuous hike but is only for sure-footed and very careful walkers. You must cross the creek several times in an area where there are steep, sloping and sometimes slippery rocks. People often fall trying to negotiate this section. If you get to a place where you do not feel safe or sure, turn back! To get here from the KY side, take RT 80 southeast from Elkhorn City (past Ratliff Hole and Pool Point above). The driveway to the parking area is a very obscure road on the right in the middle of the 180 degree right hand turn before you cross the Virginia State Line. If you cross into Virginia, you have gone too far. (From the VA side, go north on RT 80 from Haysi. Keep going until you cross the Kentucky state line. Right after you cross the state line, you will go around a 180 degree left hand curve. The road will be on the left in the middle of this curve, and it is right across the street from a house.) At first glimpse the parking area looks like a downhill driveway, so drive slowly and look for the picnic shelter which is easily seen at the bottom. It is easy to miss or mistake for a driveway. Once you arrive at the parking/picnic area, take the Center Creek Trail (there is a trail sign visible across the creek from the picnic area). Shortly, while following this trail downstream on the right side of the creek, you will come to a place where the creek is hemmed in by a rock cliff - here you cross the creek and walk on the other side then cross back as soon as you can (be very careful of steep slopes and very slippery rocks here.) 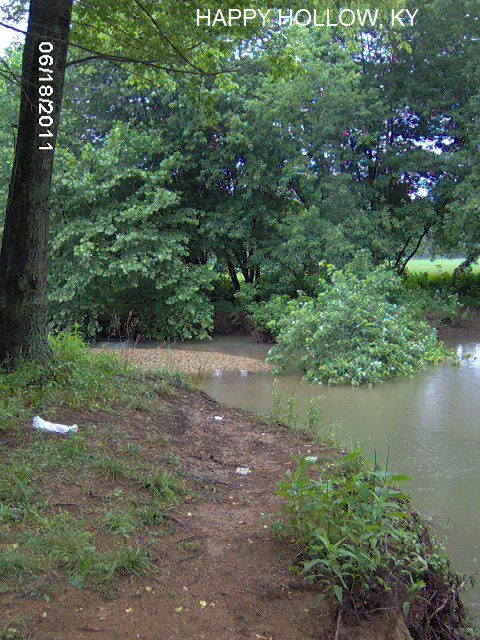 At .25 miles from the parking area, Center Creek will flow into Grassy Creek. 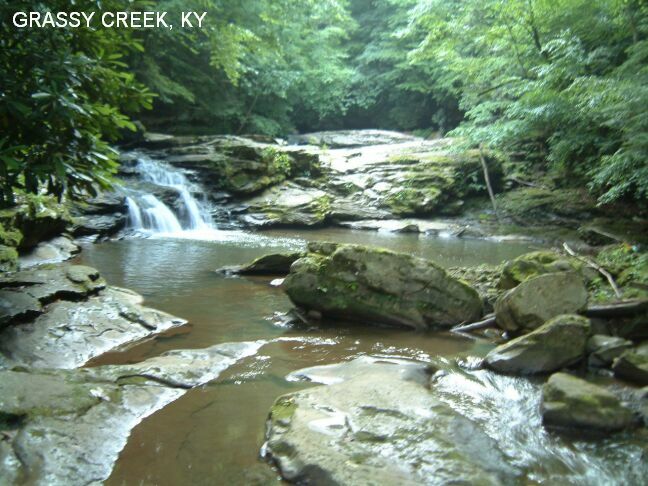 At this point, go to the right and follow Grassy Creek downstream on the right side of the creek. 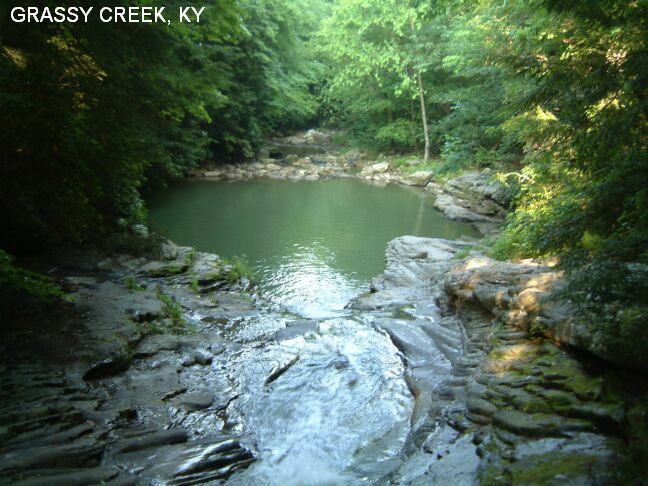 You will see several obvious swimming holes along the way PHOTO , PHOTO but these are not the main one. At about .2 miles from the junction with Center Creek, you will see about 3 trees down across the trail and the trail forks downhill to the left. Go to the left (it's a downhill trail that goes to the creek) and walk along the rocks at the shore. The swimming hole is just ahead. PHOTO 1 , PHOTO 2, PHOTO 3. Very confident. Verified 6/2006. Updated 6/28/2006. River swimming hole (locals say "Byoona Vista")features a stairway of rock at the end of which is a decent-size rock to sit on, jump from, or fish from. Water is 15 feet deep at this point. It is next to an old (discontinued?) water pumping station. The river usually flows freely between two damns about a mile apart. Only when it's very dry is there a film on the water that is not very enticing. This from a neighbor:� Most people that visit it are fishermen. There is a gate made of 2" pipe painted silver that you can easily crawl through, then a short walk to the Lebanon City intake station. Step over the barb-wire fence, down a 20' bank to a ledge. Be careful stepping off of the ledge into the water because it drops off quickly. Swim at your own risk. Swim w/o bathing suits at your own risk. DO NOT leave any trash in the area or outsiders could be locked out of the hole." From Danville, go west on RT 150 to Perryville. Then go southwest (left turn) on RT 68 (passing near "Penns Store" swimming hole) and go through Lebanon. Just west of Lebanon, take RT 208 south (left turn)(set odometer). In about 2.5 miles (before Calvary) take Lovers Lane west (left turn). This from a local:� Park your car by a cattle gate on Lover's Lane (unknown exact location) and walk a short distance through a hay field. The spot is, I think, still owned by the water company, so the owner of the field is happy to let people pass through." PLEASE RESPECT THE WISHES OF THE OWNER OF THIS FIELD IF THEY DO NOT WANT YOU TO PASS! (Dont know too much about this place - be careful in checking it out - and tell us what you find, please.) Swimming place in Clear Creek near the Clear Creek Baptist Bible College and Pine Mountain State Park outside of Pineville. At Pine Mountain S. P.
From Corbin (I-75, Exit 29) take RT 25E (Cumberland Gap Pkwy) southeast through Pineville. Just past Pineville on RT 25E, turn right on Asher-Clear Creek Rd. and continue to the Clear Creek Fitness Trail trailhead. Park and walk the trail about .75 mile to just before the old railroad tunnel. The swimming place is here in a pool in Clear Creek. High cliffs rise above a very deep arm of Lake Cumberland. An outstanding jumping place! Very high (and lower) jumping into very deep, emerald blue water. NOTE THIS received in 5/2011: "Due to the Wolf Creek Dam repairs this arm of Lake Cumberland is low. Jumping off the cliff is no longer safe. It is still possible to swim although the swimming area is also limited. Thought I would update since the repairs seem to be lasting a lot longer than expected." Nearby at Lake Cumberland State Resort Park. From Danville, go southwest on RT 127 to Jamestown. Continue 6 miles past Jamestown on RT 127 then turn left on Clifty Creek Rd.. Follow this road for 2.3 miles to the end of the road at a boat ramp on Lake Cumberland. Park and take the path to the right along the lake, beginning at the very end of the road. It is a short walk to cliffs high over the lake. Pretty falls with large dark water pool at the bottom. Spring time would be best for swimming; later in summer there is not much water. Below Cumberland Falls, the Cumberland River has a 16 mile stretch before it reaches the backwaters of Lake Cumberland. 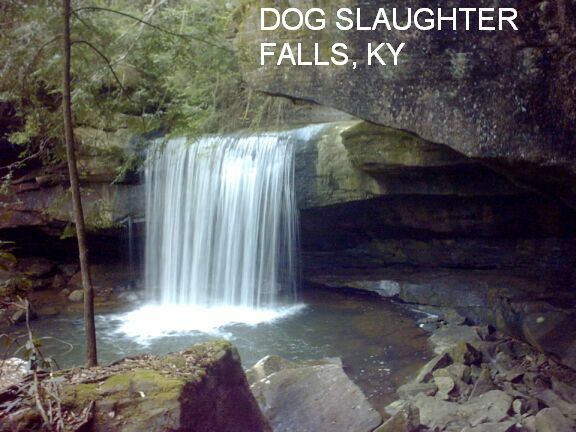 In this stretch of river there are several falls, including Dog Slaughter Falls on the Dog Slaughter River which runs into the Cumberland River. 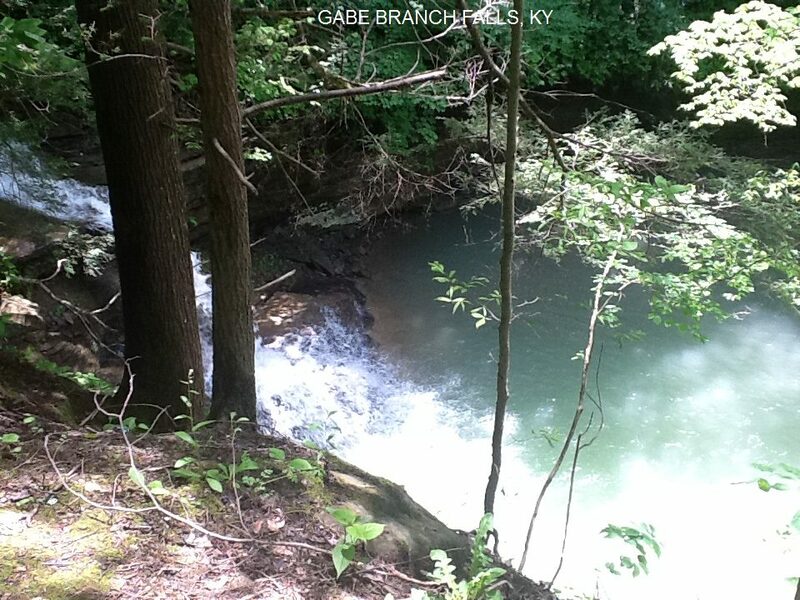 Swimming hole is in the pool at the bottom of Dog Slaughter Falls. 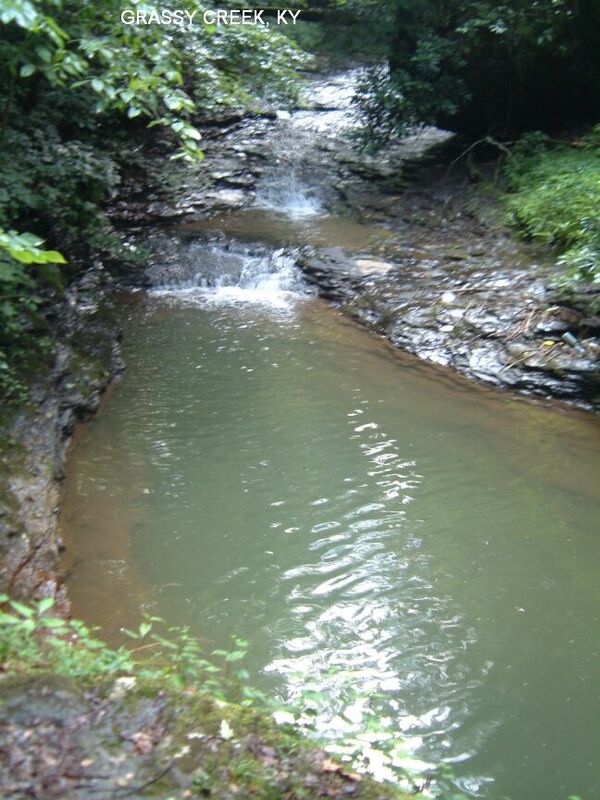 This e mail in 2006 from a visitor:� Just thought I drop an email and verify this is still a very viable swimming hole... Some info you might want to add is the trail to Dog Slaughter is no where near "moderate" there are lots of steep inclines and boulders to traverse, and if you decided to continue to the river the remaining .25 mile is definitely strenuous, with many near vertical climbs requiring edging with boots. People with weak ankles and knees should not attempt the remaining .25 miles of the trail beyond the Falls. As for swim suits, early in the season they probably aren't really needed, but during the summer this is a stopping point for the white water rafting groups. So in this case I would say follow whatever everyone else is doing. But, I would imagine suits would be customary. As for the directions to the trailhead they are dead on, and there are camping spots at three different places along the trail with fire-pits already built." From London, go south on I-75 to the area of Corbin and take RT 25 west. Then go west on RT 90. Before you get to Cumberland Falls State Resort Park, you will see Forest Rd. 195 (unpaved) on the right. Turn right and go about 2.7 - 3.0 miles on this unpaved road and see a wide spot in the road to park. Park here and take the trail on the left. Cross a small footbridge and go right. It is a 1.5 mile hike to the falls. Huge, deep, commercially operated quarry with swimming and scuba diving. See web info above. Yes, about $10 to swim, $20 to scuba dive. Camping at site on Saturday nights. From I-71 Exit 22 at La Grange, take 1st Street north through town then turn left on Fendley Mill Rd and continue to Falling Rock Park. The address is 2201 Fendley Mill Road, La Grange. Huge swimming hole at bottom of large falls. Off the beaten track, definitely. Very nice with gentle slopping into deeper pool. Also stunning because surrounded by rock cliffs forming the round swimming hole. Very remote, so bathing suits optional. No one there even on this Saturday. From Harlan take RT 421N, then take right on RT 221, then left on RT 2009, and then right on RT 2008. Stay on RT 2008 (it starts as paved but alternates paved and dirt) until take right on Abner Branch Road, which is a dirt road to right, but not signed. (You can recognize it from a big rock there on left with graffiti and paved road with stop sign on left.) Stay right onto dirt road and cross little bridge, then go 0.7 mile. 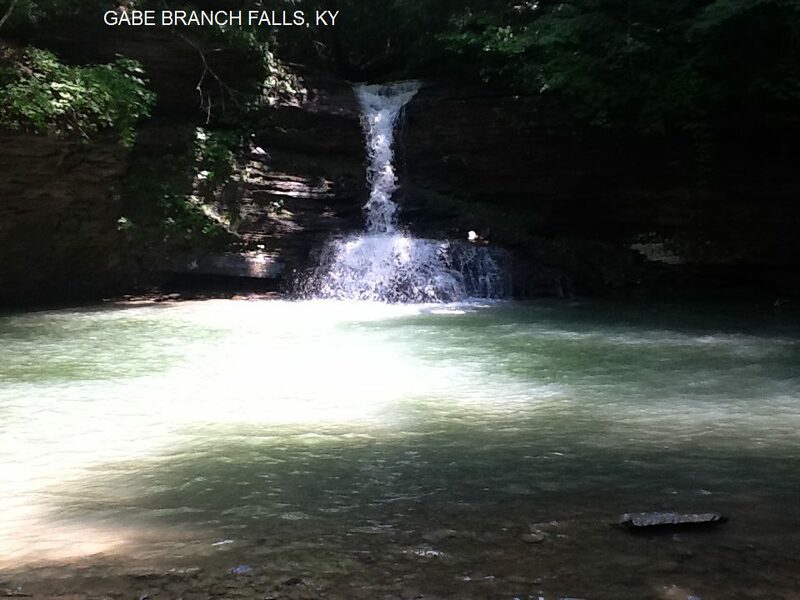 Gabe's Branch Falls is located on Abner Branch Road (CR-1133) .7 of a mile east of RT 2008. At that point a small gravel road will drop off the low side of the road. There is no sign. Park here and walk down a short set of stairs that leads to a rocky outcropping above the falls. A short, slick foot-trail will lead off down the ridge and finally to a set of slick stairs that reach the creek. The falls will be on your left. A "great therapeutic little riffle" on the main branch of the Licking River between Butler and Falmouth that is better than any hot tub. It is accessible only in low flow, as in July, August and September. It is accessible only by canoe, tube or raft. Swimming holes near Temple Hill. See DIRECTIONS below for details. There may be camping at the Park and Fairgrounds. Lots of camping west of here on Barren River Lake. HAPPY HOLLOW [HAPP]: Long-time local swimming hole in Skaggs River at the Happy Hollow Rd. bridge. PHOTO , PHOTO , PHOTO.LAT, LON :lat=36.87814, lon=-85.86412(source: Map) (accuracy: approximate) LINK TO GOOGLE MAP. To get here from RT 63 going south, as you approach Temple Hill (just before the Temple Hill Baptist Church on the right) turn west (right) on Happy Hollow Rd.. Continue a short way to the bridge over Skaggs Creek. The swimming hole is here. Very confident. Verified by another. Updated 1/2013. LIONS CLUB PARK [LION]: Swimming hole in Skaggs Creek at Lion's Club Park and Fairgrounds in Temple Hill, which includes a picnic area and dock. There may be an admission fee for swimming and/or for camping. LAT, LON :lat=36.86362, lon=-85.83305(source: Map) (accuracy: approximate) LINK TO GOOGLE MAP. To get here from RT 63 going south, continue past Happy Hollow Rd. (above), through Temple Hill and across the Skaggsville Creek bridge on RT 63 then turn left on David Smith Rd. and go into the park. The swimming hole is here. Address: 10168 Tompkinsville Road, Glasgow, KY 42141. Phone:(270)427-4304. Very confident. Verified by another. Updated 1/2013. "The PENN HOLE property no longer belongs to the Penn Family (the still own the store itself). Another person bought the property several years ago. The following is their policy: NO MOTORIZED VEHICLES allowed on their property leading to the creek and NO MOTORIZED VEHICLES in the creek bed at the PENN HOLE. [ 4 wheelers were destroying not only the area for others to enjoy, but destroying the new property owners crops, gates and fences.] HOWEVER ... people wanting to SWIM, FISH, PICNIC, and enjoy the river is fine. There are some places along the road where one can park to go to the creek." PLEASE RESPECT THEIR WISHES OR DON"T GO!! "First off, let me give you a little more information about the store. Since 1850, the Penn family has owned Penn's Store, the oldest country store in America in continuous ownership and operation by the same family. We are on the National Registry of Historic Places and are also a Kentucky Centennial Business. Penn's Store is a working country store and we also have arts and crafts made by Kentucky artists as well as books and writing by Kentucky and national authors. For more detailed information on Penn's Store, including a map and driving directions, you may go to our website PENN'S STORE WEBSITE." Penn's Store now has PICKING & SINGING on some Second & Third Sundays each month. "Penn's Store is situated at the junction of two rivers, the Little South Creek and the North Rolling Fork River. 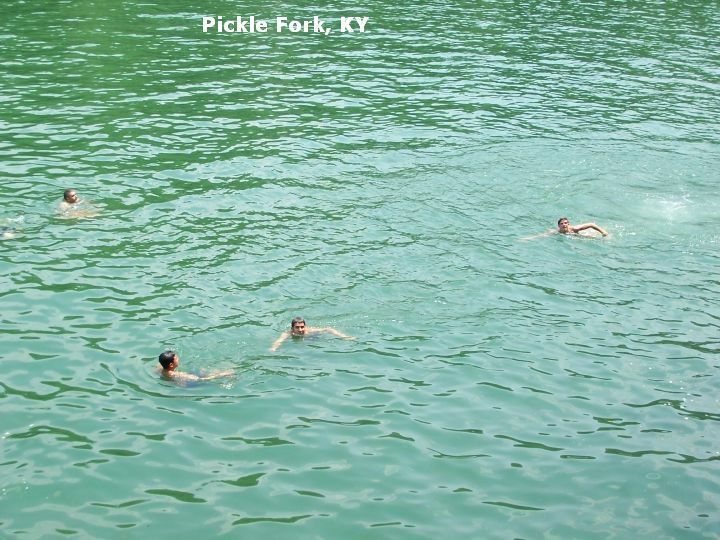 Originally known as the "Hickory Hole," this area was a very popular site for swimming and fishing. As a young child, my grandmother (now 85 years old) and her 9 siblings enjoyed the 9'-12' deep pools of clear water. 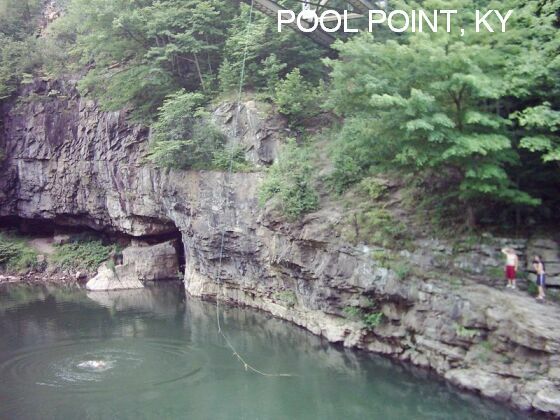 Because of its location near the store, the swimming hole became known as the "Penn Hole" to younger generations. It still provides old-fashioned water fun for people from all walks of life. "Rock-hounds" often walk along the gravel banks searching for unusual rocks, relics, and geodes. Many people bring picnic lunches or dinners to enjoy along the banks, taking in sun during the day and looking at the wide open star-lite skies at night." "Thank you for including us on your website. We'd like to invite you and your family to visit us at Penn's Store." Cliff jumping place (ranges from low to VERY high) into impounded lake below. This note from a visitor:� Always look into the water before jumping for the first time, but this place seemed to be a safe place to jump. It's well known to a lot of people in the county and people have been jumping here for years. There were also several local people there when I went and all of them jumped very safely. There are some obvious underwater trees to the right and maybe to left of the high cliff (I can't remember if they were to the left as well), and there may have been some on the low cliff, but I don't remember. Either way, I had plenty of room on both cliffs and didn't have to worry about any underwater obstacles. You can see the branches that are sticking up from the water, so stay in between them and you'll be fine. 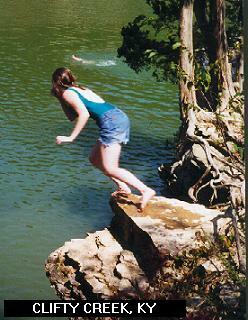 If you jump off of the 30 foot cliff, you have to swim to the lower ledge of the 25 foot cliff to get out of the water. I was also shown a 10 foot cliff which is to the left of the 25 foot cliff, but I didn�t go off of it. There's an 80 foot cliff across the lake that you can see when you're standing on the 25 foot cliff. " Paintsville Lake S. P. (on the east side of the lake, near Saffordville) has camping. Take I-64 to the Bert T. Combs Mountain PKWY. Stay on I-64 until it becomes RT 460 (You'll drive all the way through the Daniel Boone Forest). When Bert T. Combs Mountain PKWY becomes RT 460 turn left at the RT 460 junction towards Salyersville. Take RT 460 into what I think is downtown Salyersville and the road will T at RT 40, which is also a traffic light. Go Right on RT 40 towards the town of Oil Springs - You'll stay on RT 40 for approx. 15-20 minutes. From RT 40 go left on RT 580. (There's a white church building called Oil Springs United Methodist Church right on the corner of RT 40 and RT 580. This is where you'll be turning onto RT 580.) Take RT 580 for approximately 8 miles. You might see some signs for the Paintsville Lake Outdoor Education Center. You'll be passing this place on your left. Keep going on RT 580, and watch for county route RT 2318. Turn left on RT 2318, and follow it about 1/4 mile. (Note, if you pass Colvin Branch Road, you've passed the Route 2318 turnoff.) Route 2318 will curve to the left. A little past the curve you will see a white gate on the right. There is a no parking sign on the gate, but you should be able to park somewhere else along the side. Walk down the path about 100-200 yards. Right before you get to the end of the path be looking to your right for a break in the trees that will take you to a thirty foot cliff and a twenty five foot cliff. (Dont know too much about this place - be careful in checking it out - and tell us what you find, please.) 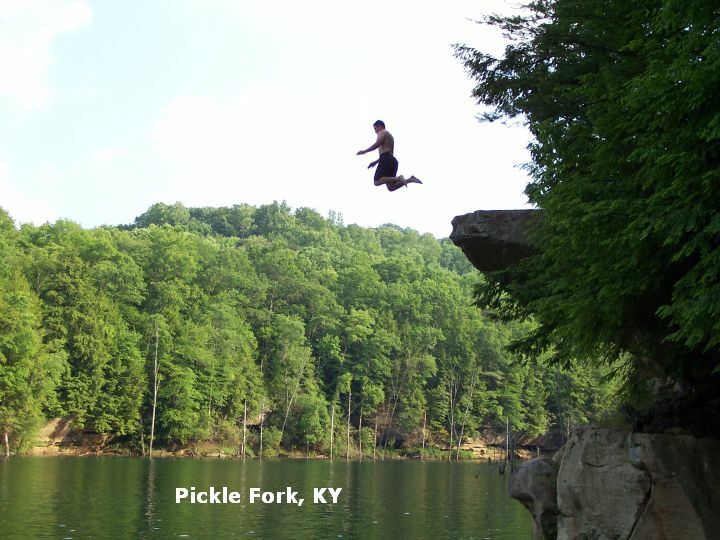 Swimming and jumping place in old quarry adjoining Pisgah Bay of Kentucky Lake at Land Between the Lakes National Recreation Area. WEB INFO . Most people come here by boat, but you may be able to hike about 1 mile each way to get here also - not sure - see DIRECTIONS below. Most people come here by boat - get local boating information to do this. The coordinates above may help you. You may be able to hike about 1 mile each way to get here also - not sure of this. Here is what it looks like might work to hike (Dont know too much about this hike - be careful in checking it out - and tell us what you find, please. ): From I-24/69 Exit 31 (Land Between the Lakes area) go south on RT 453 (Dover Rd. then Woodlands Trace) past Twin Lakes Campground then follow signs to Hillman Ferry Campground. (Directions pretty uncertain from here on) If you continue past Hillmans Ferry Campground , the road appears to end pretty shortly. Park and hike south along the west side of Pisgah Bay (dont know about the trail here or even if there is one) about 1 mile to the Rock Quarry. No better directions. 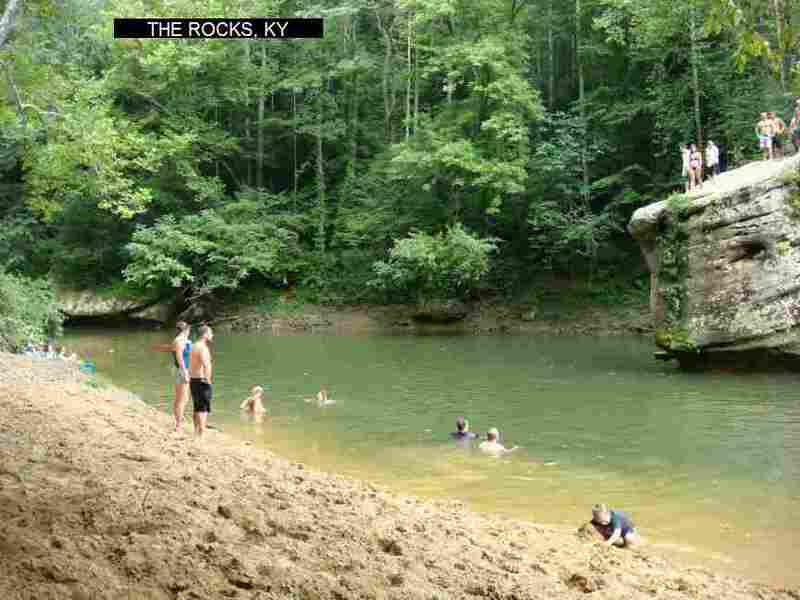 Swimming holes in the Red River Gorge area. See DIRECTIONS below for details. Red River Gorge, Daniel Boone N.F. There are several campgrounds in Daniel Boone N.F. Nearest is Koomer Ridge (pretty primitive), near town of Pine Ridge. More developed (swimming, boating and crowded) but further away are Zilpo and Twin Knobs on Cave Run Lake, still in the N.F. 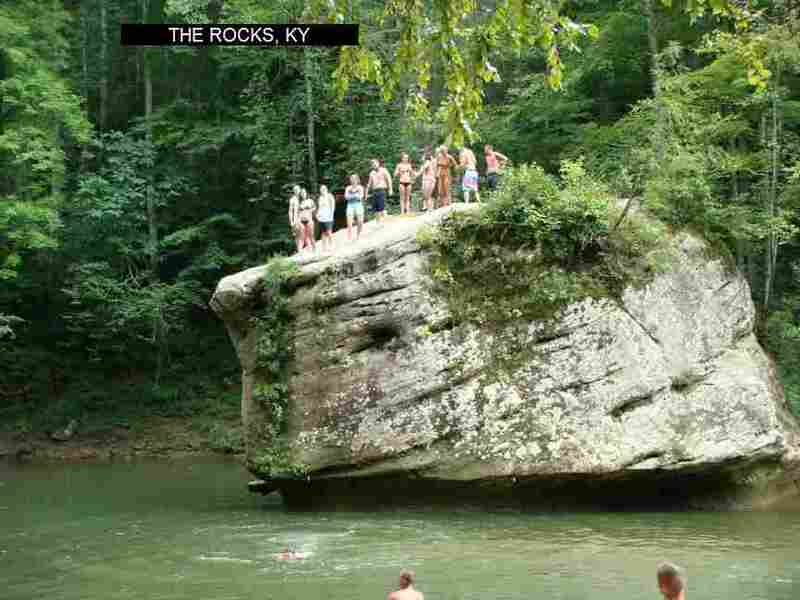 THE ROCKS [ROCK]: Swimming hole in river below high rocks. Huge rock to jump - check first before jumping for safety. PHOTO , PHOTO , YOUTUBE , YOUTUBE. LAT, LON :lat=37.82511, lon=-83.58592(source: DeLorme) (accuracy: approximate) LINK TO GOOGLE MAP. To get here from the Suspension Bridge (above) continue east or RT 715 (an unknown distance - maybe 5 miles) and look for a sign indicating Mile Post 1. There, on the south side of RT 715, are the high rocks (visible from road) and swimming hole below. Pretty confident. Not verified. Updated 12/8/2008. This is a one-off swimming hole - a creek that emerges from the ground, goes 100 feet (enough to form a small, shallow swimming hole) then dives back into the earth. Cold water! Strong currents possible after rains. This place is on private property - it belongs to Elwood Taylor and his wife who live in Stab. They don't mind people going to the property as long as they don't trash the place. PLEASE PLEASE PLEASE do not abuse this privilege! From Somerset, take RT 80 east almost to Buck Creek. You can see the old bridge on the right, and some buildings and houses. That is Stab. A little before that, turn right at the last right turn before the bridge on RT 80. After turning, you will quickly come to a T, which is the old road. Turn left and go through Stab and up a slight hill and take the first turn to the right, which is Short Creek Rd. 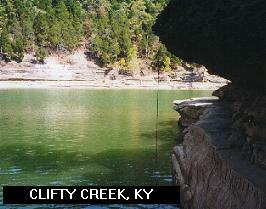 It winds down to Short Creek, and the entrance to Short Creek Cave, which is on the right. There is a little parking area. This place belongs to Elwood Taylor and his wife who live in Stab. They don't mind people going to the cave property as long as they don't trash the place. PLEASE PLEASE PLEASE do not abuse this privilege!